Literally: “strips card” / “card with strips”. In the Dutch public transportation system, a certain card is in use with so called “strippen” (“strips”). These have to be stamped when travelling by bus, tram or metro. This so called “strippenkaart” can be bought at several locations: at the ticket office of the Dutch railroads, at the ticket office of the local tramcompany, at the Albert Heijn and at the post office. Two kinds of “strippenkaarten” exist: the blue “strippenkaart” for ‘normal’ users, and there’s the pink “strippenkaart” for users in the ‘discount categories’ (elderly people (65+), students, little children). (“Madam, you have not stamped enough strips, I’m afraid that we’re going to have to give you a fine.”), see also ‘Extra’. 1. “Openbaar vervoer” or “OV”: public transportation. 2. 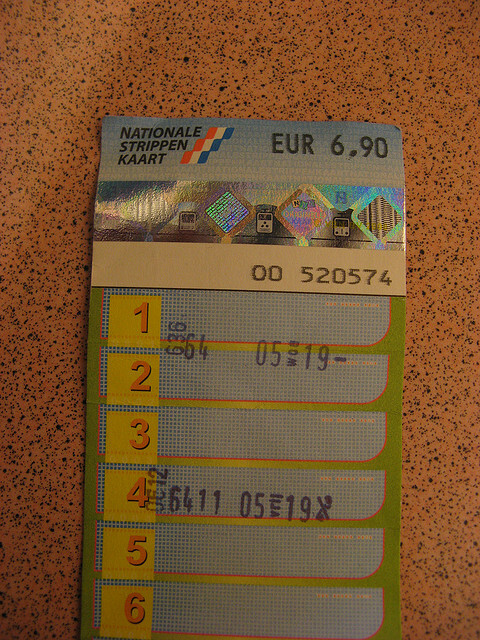 “Kaartje”: ticket (for a ride on the tram, literally: “little card”). 3. “Enkeltje”: one-way ticket (literally: “little single”). 4. “Retourtje”: return ticket (literally: “little return”). The number of strips that has to be stamped equals the number of public transportation zones that are travelled in, plus 1 (Dutch logic…). In a bus, stamping is done by the driver only. In the tram in The Hague, stamping is done by either the driver, or by oneself in the designated stamping machines. In Amsterdam stamping is often done by a designated person who sits in a cabin in the middle or back of the tram. This entry was posted in Dutch word of the day, DWOTD 1.0, Vocabulary Basic and tagged openbaar vervoer, strippenkaart, vervoersbewijs by Dutch Gurus. Bookmark the permalink.